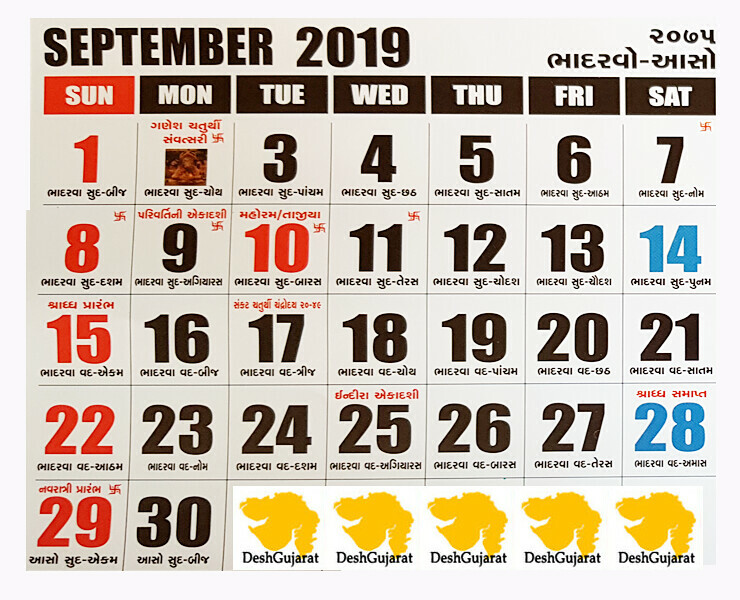 In our endeavor to cater the best that Gujaratis across the world need, we are launching Gujarati Calendar consequently for second year. 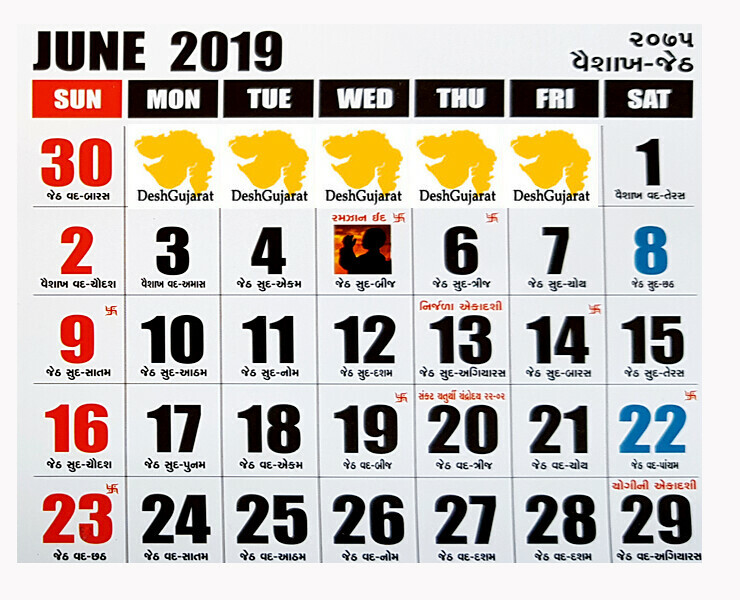 This year we have created a Gujarati calendar in bigger size(1007X727). So that you can make a wall-paper out of it for your pc. 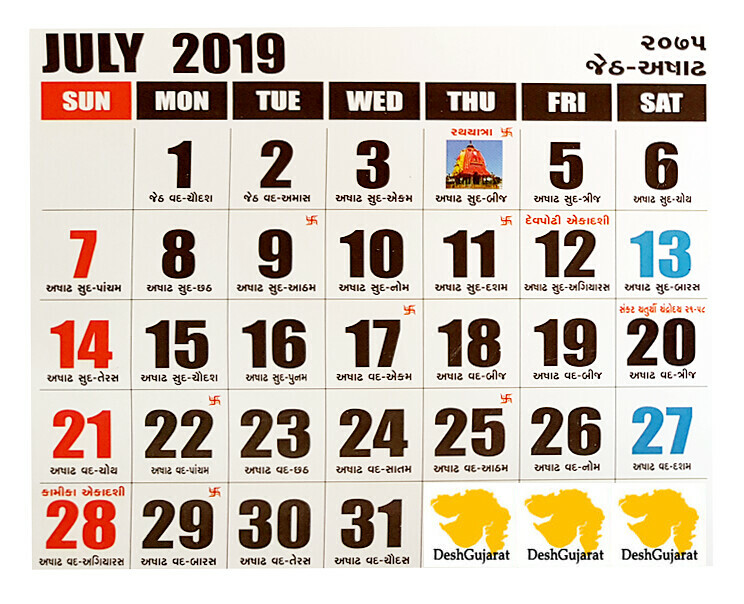 Some Gujaratis related affairs are added in relevant date boxes of our Gujarati calendar e.g. 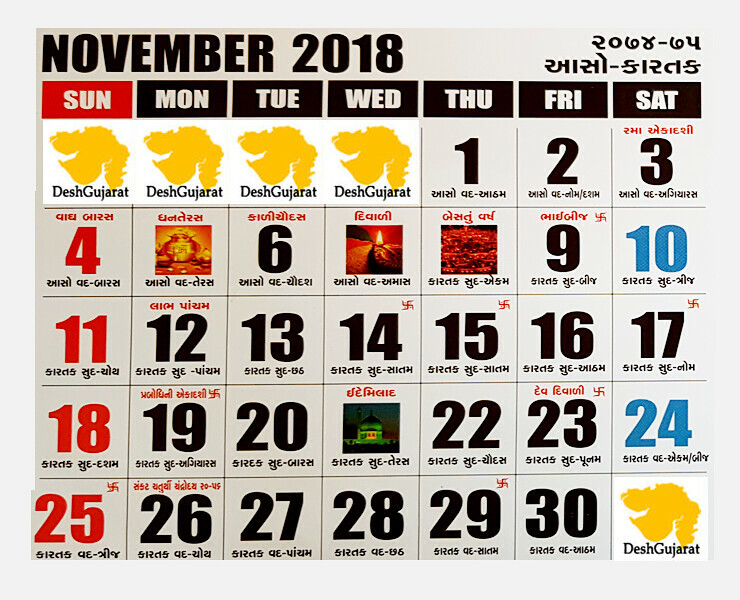 if we take November, you will never find Sardar Patel’s Somnath rebuilding pledge making date’s reference present in any other calendar or you can never ever find ‘Girnar Lili Parikrama’s reference in any other calendar even though the fact that Parikrama is attended by over a million Gujaratis every year. 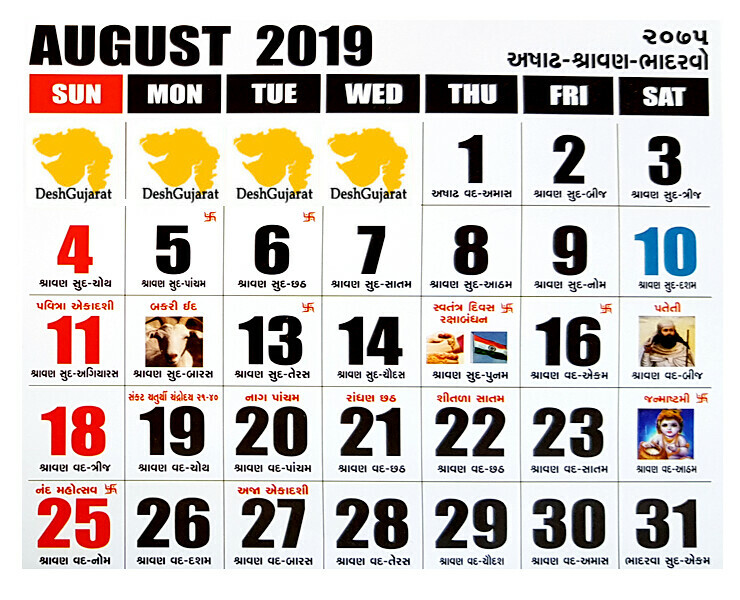 We have placed these and more affairs in our Gujarati calender’s date boxes. 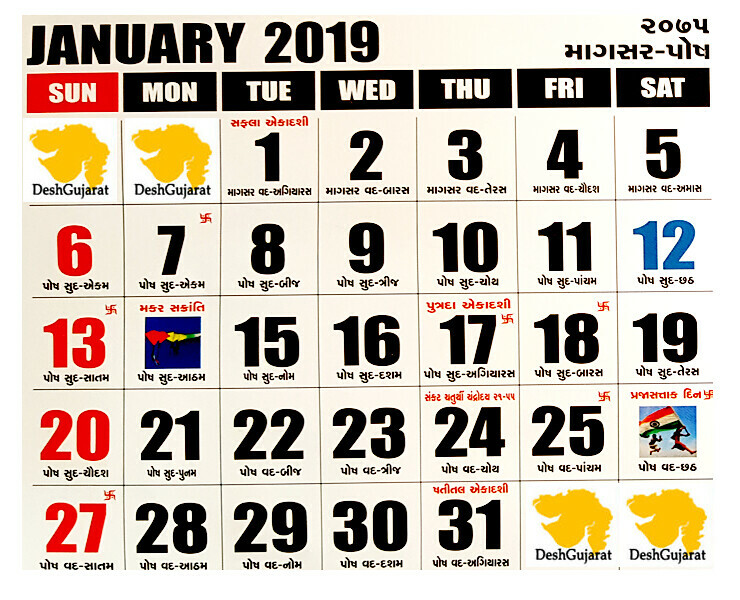 While making this Gujarati calendar, we driven by Gujarati cultural patriotism have taken some new initiatives and liberties on our own e.g. 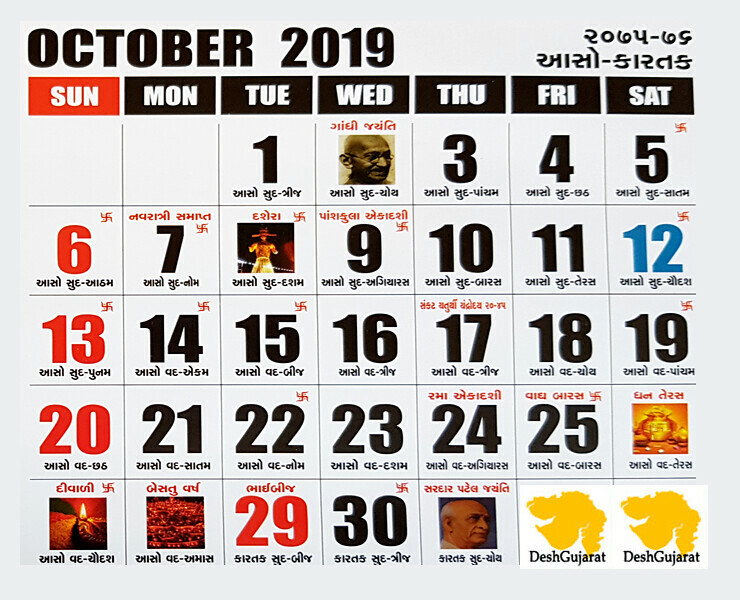 in November, we have termed Gijubhai Badheka’s birth date as ‘Gujarati Children Day’ and Thakkarbapa’s birth date as ‘Gujarati Tribal day’. We have also mentioned some informative details in date boxes e.g. 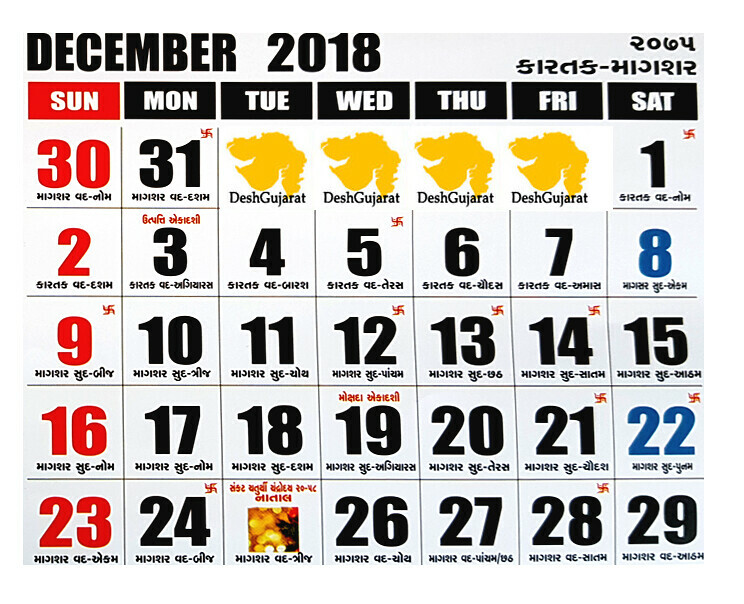 we have added information on when Diwali school vacation ends this year in Gujarat. In December we are continuing the same and even going one step ahead. We have added some interesting events that are going to take place in December in the state. We believe that in digital age, the Calendar should be live. At least ours will be like that for sure. Currently we are releasing only November-December calendar page. All the other months pages will be released one by one after this and will be interlinked. Your suggestions are welcome. 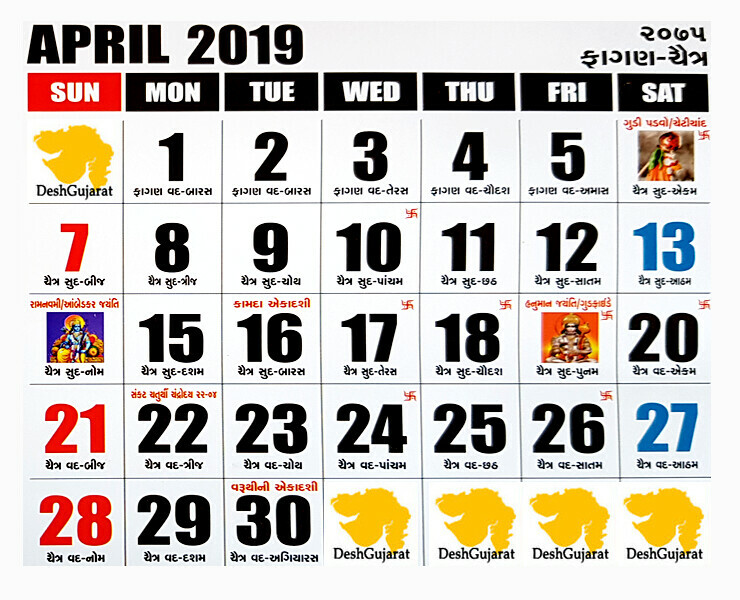 To download the calendar given below, (1) Press right click of your mouse over the image of the page, (2) Select ‘Save Image As’ option, (3) Click over your selection. To make it as a desktop wallpaper, (1)Press right click of your mouse over the image, (2) Select ‘Set as Desktop background’, (3) Click over your selection. Note:Please wait till all images are loaded. To download this: Please right click on image and click ‘save image as’. Each picture file is in png format. The Western calendar is based on the sun, in which a year is the time required for the earth to complete one orbit around the sun. This precisely measures 365 days 5 hours 48 minutes and 46 seconds. 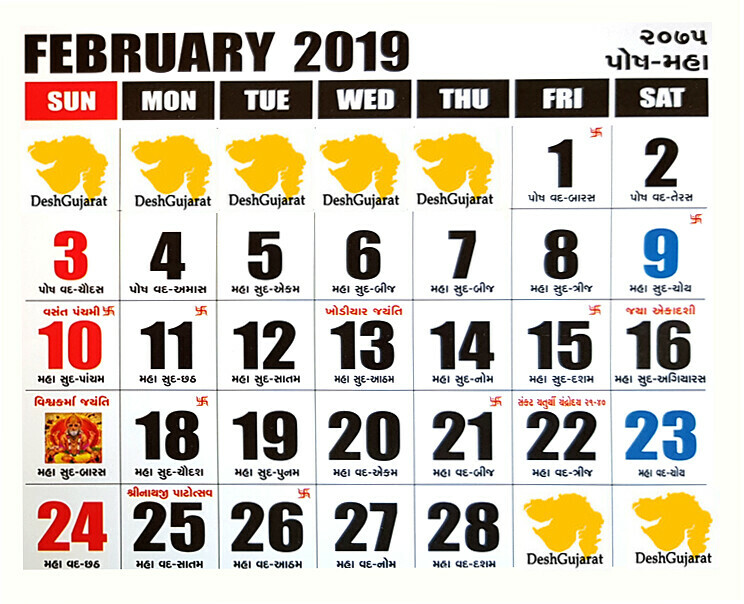 The Indian calender is ingeniously based on both the sun and the moon; it uses a solar year but divides it into 12 lunar months. A lunar month is precisely 29 days 12 hours 44 minutes and 3 seconds long. Twelve such months constitute a lunar year of 354 days 8 hours 48 minutes and 36 seconds. To help the lunar months coincide with the solar year, the practice of inserting an intercalary (extra) month arose. So 60 solar months = 62 lunar months. Hence an extra month, called the Adhik Mas, is inserted every 30 months i.e. every 2 ½ years. Lunar days in the Indian calendar are called tithis. They are calculated using the difference of the longitudinal angle between the position of the sun and moon. Because of this, tithis may vary in length. Consequently, the tithi may or may not have changed by the time the day has changed at sunrise. And that is why we find at certain times a tithi being omitted, and at certain times, two consecutive days sharing the same tithi. In the Indian calendar, seasons follow the sun; months follow the moon; and days, both the sun and the moon. The era in the Indian calendar is called the Vikram Era, or the Vikram Samvat, which began in 57 BCE. To calculate the corresponding year of the Common Era, 57 years should be subtracted from the Indian year if the date falls between the beginning of the Indian year and the end of the Western year i.e. between Kartak sud 1 and 31 December. 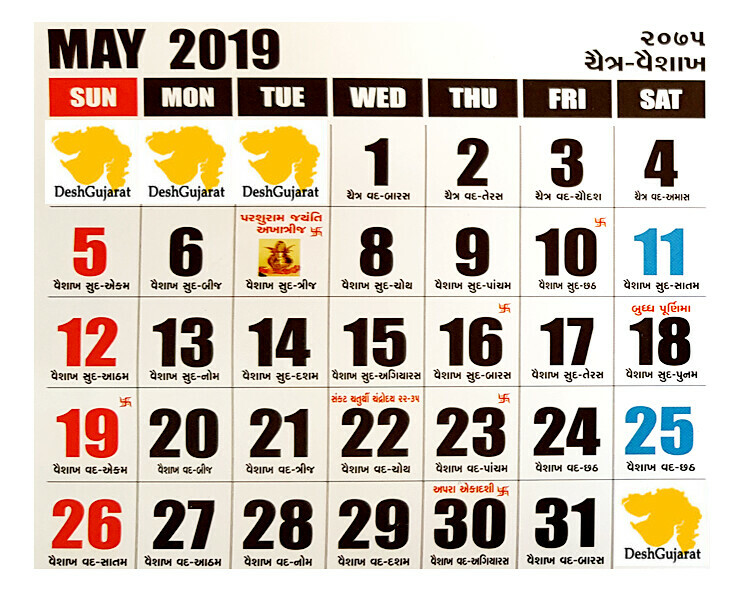 If the date falls between the beginning of the Western year and the end of the Indian year i.e. between 1 January and Aso vad 30, then only 56 years should be subtracted. 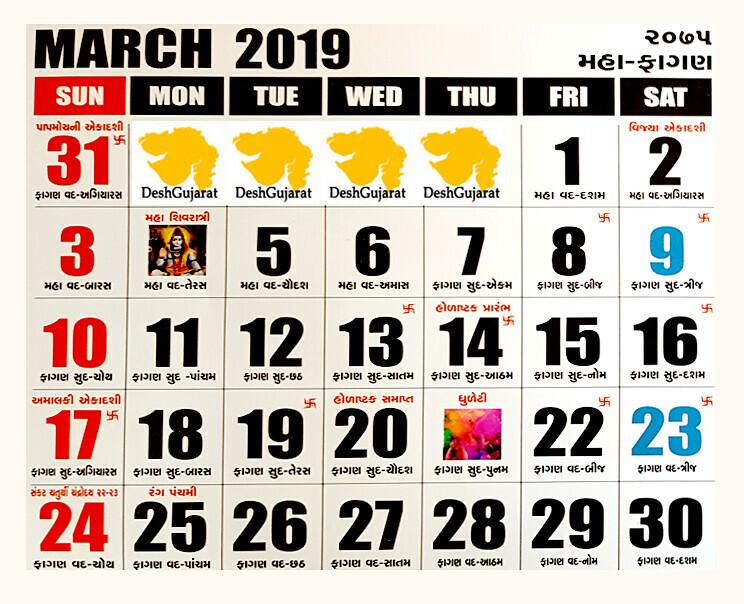 We present the 2019 year calendar with the tithis, dates and holy festivals of India.